Sometimes when I go to a show, I have nothing else to do but sit and draw. Well, this is the result of drawing like that, and what's better...I often sell the drawings on the spot. And it reminds me of how I want and need to do more *drawings* for the sake of themselves. These were done with conte crayon & white chalk, on Canson paper. The drawings I do are usually done to get down on paper something I want to do bigger in a painting. 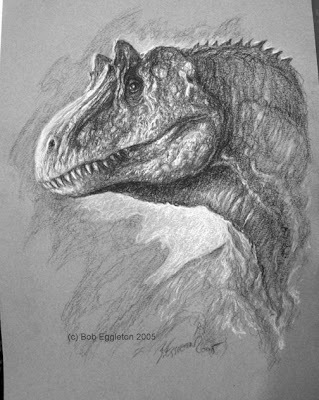 I like how the Allosaur turned out alot. Because it's all done on the fly, the drawings are sold there, and we have to shoot a quick digital pic to have some record of them. I posted these to remind myself to do more drawings. I'm just surrounded by Brian Lumley. Top pic is the new cover to Brian's new Necroscope adventure in "the Lost Years" time- HARRY AND THE PIRATES, done for Solaris Books in the UK. Lots of fun as always. The middle image is a reminder that at www.subterraneanpress.com you can buy, right now, the newly published Lumley collection HAGGOPIAN AND OTHER STORIES with what I consider one of my finest paintings on the wrap cover. If that's not enough, on June 10th you can buy the 20th Anniverssary edition of NECROSCOPE which first brought Brian and I together all those years ago. The bottom picture is something I shot in Oregon. 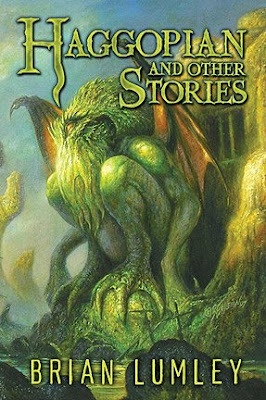 Cthulhu in his natural enviroment!!!!! 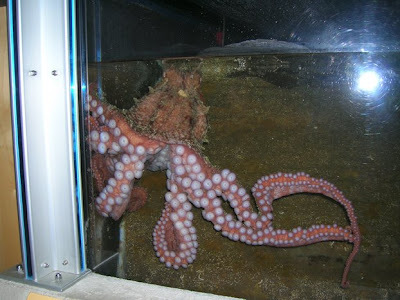 No, really, it's an octopus and one of the rare times I've seen one really active and rearing up...and look at his texture! 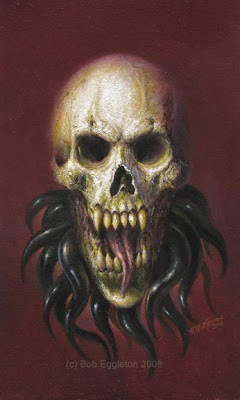 This is reference fodder for all kinds of creature pictures!!! FAQ#3 "Why did you change your style?" Just a quick post. I get asked alot of questions. Probably the 3rd most popular is "Why'd you change your style from what you did in the 80's and early 90's?". I think what people mean is why did I drop using an airbrush, almost overnight. An airbrush is a device by which air pressure is pumped through a small gun with a needle and this pushes a cupload of paint to the needle tip and aerosolizes it. At one time it was the "thing" everyone used. It produced a highly polished finish to pieces, sometimes seamless and, textureless. Alot of people created nebulae and galaxies with it. Alot of this same look can be more successfully done on a computer to jaw-dropping results. For me, I did all that. Then a few things happened. First, I started feeling like I lost the ability to "connect" with my work, the tactile feel of a canvas is something I crave. It all looked the same and had this sometimes weird "fuzzy" feel to it. I was reminded of the sides of those cheesy 1970's recreation vans that were all gloss and pink shag carpeting inside. The other thing and most important, were health concerns. I found myself developing an unwanted "cough" similiar to a smoker's cough and I was getting something like five colds or bronchial infections a year! Then I read about an airbrush artist who died of a emphyzema because his lungs had all aerosolized acrylic paint in them. Sure there are devices to stop the dust, but when you get to that point...why bother? So about 1997 I started painting and, I mean...really painting. Connecting with the art and canvas...and it felt emotionally great. Also, my colds went away!! In fact the last time I had a bad bronchial bug was in May 2005 and that was thanks to a long jet trip. And the work looks better, my emotions connect with it, and I seem to be learning more and more every single time I work, rather than repeat the same old thing. It comes down to art is exploration and evolution and that's what keeps it exciting. The Art Corner,INDY 4 and other housekeeping. In other news....saw INDIANA JONES AND THE KINGDOM OF THE CRYSTAL SKULL and loved it. It's a great fourth -and possibly final-installment in the series which last saw the screen in 1989!! It's like a big, 1950's Sci Fi film...lots of cliches, lots of impossible stuff...lots of nostalgia but that's what we love isn't it? Films like this are fun-ditto IRON MAN, PRINCE CASPIAN, SPEED RACER and, a film that was released for only two days this past week, DEATH NOTE-a Japanese film by director Shusuke Kaneko that's quite something to see. A tip of the hat to an author I knew well, Robert Asprin, who died literally, with a science fiction book in his hands whilst on his sofa waiting to be picked up to be flown to Marcon this weekend where he was to be Guest of Honor. No cause is known, only what appears to be a sudden death. Posts will be sparse this week as it's going to be a busy busy time. Things become clearer in June, so, hang tight. I'll try to put something up this coming week. 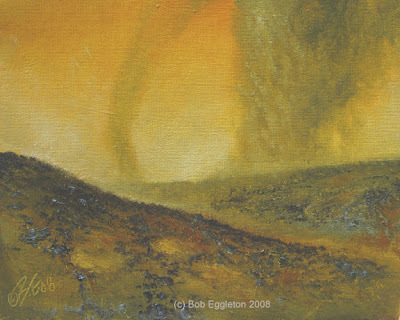 Martian Dust Storm(8x10,oils SOLD) Phoenix will land on Mars, in the polar region this coming Sunday. It will be fascinating to see what views we see. Mars is an amazing planet. It seems we know it so well with our recent explorations by our roving probes- Spirit and Opportunity-two of the best investments that really went above and beyond everyone's expectations . I'm also fascinated with tornadoes and windstorms...and MArs has it's own versions of that. In this, we see two Martian dust devils towering into the thin atmosphere. While imposing and huge, they're only a breath compared to the tornadoes we see on earth(like the massive one that struck north of Denver, today. I'm planning some bigger Mars paintings of late, this is just a quick taster of things to come. 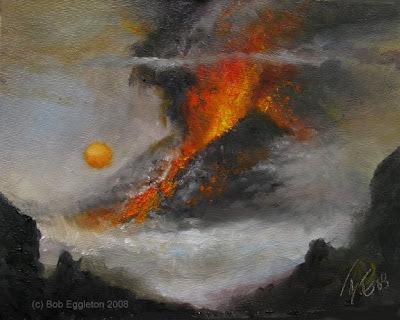 Natural disasters-tornadoes, volcanoes, earthquakes, hurricanes, etc all remind us of our frailty on this planet. It reminds us of the constant forces that really run the planet, as opposed to our own..."attempts" at the mastery of things. I stare at their aftermath with a dispassionate fascination. I had an amazing dream of watching several large tornadoes approaching where I lived. It was cool and tramatic enough, in the same thought. Then, out of the blue I recieved an email from my new found pal John Brosio. John paints tornadoes like no one I have ever seen. Huge, gallery-styled works that are awe inspiring in ways that art should be, that, I long to be myself. I found it amazing I would have a dream of these tornadoes, and then, the same morning get an email from a guy who I never knew and yet admired his work for years and years-claiming he was a fan of mine! 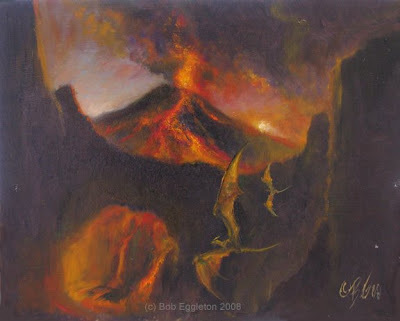 In the meantime I did two new paintings on my theme of volcanoes. What am I up to? 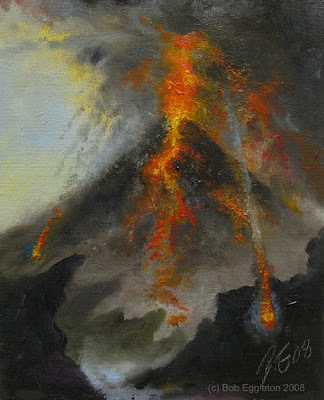 Is a BIG painting with volcanoes...in the works? Could be...could very well be.. in the meantime, enjoy. NOTE: I have been busy and am limiting my small works for this blog to about two a week now. That may change as we get into summer. Cambridge Mass, in November of this year. Looks like lots of fun! Anime! Kaiju! Costumes! Art! 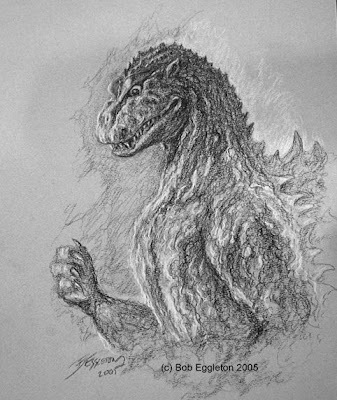 I'll have a table of work and work in the show, plus program items on Godzilla and giant monsters. This is right in my backyard and it looks to be a blast! And two weeks after I'll be appearing as Artist Guest of Honor at Bubonicon in Albuquerque NM: http://www.bubonicon.com/ These folks will be alot of fun! And their beautiful state to boot, and of course, a few UFOs in Roswell!!
" Here he comes, here comes Speed Racer, he's a demon on wheels.....(can you remember the NEXT lyrics?Hmm? )". 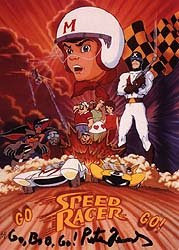 I love Speed Racer. I mean, who did not want The Mach 5 when they were a kid? I wanted it badly. I wanted a car with saws on the front and, hyper jacks to jump the car OVER other cars. I was an interesting kid. It played on Boston's Channel 56 on weekday afternoons around 3-3:30 pm. Endlessly. For years. I saw the new film and LOVED it. They hit it perfectly right on the head as far as getting right the look of things, as they might in real life. Visually it's a knockout and you have to just check at the door any pretentions-just enjoy it. 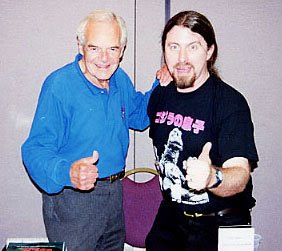 Anyway he's me in a fanboy moment with Peter Fernandez, from about 7 years ago. Fernandez is a director, writer and actor who supervised the dubbing of the original anime from the late 60's. He, Corrine Orr, Jack Grimes and others all had these trademarked voices with which they could be heard not only on SPEED RACER, but other animations from Japan, and even some of the Godzilla movies(GODZILLA VS THE SMOG MONSTER, 1972 notably) and some of the westerns from Italy. Fernandez does a cameo as a race announcer in the start of the new film! I've been quiet because I've been a little overwhelmed. However I did do a new painting of the day, that already has been sold to someone in France, but I'll display it tommorrow for all to see. Amazingly it's May already...which always reminds me of a few lines from one of my favorite films-AIRPLANE! Capt Steve McCroskey: Mayday? What the Hell is THAT for? Johnny: Mayday! Why that's the Russian New Year, we can have a big parade and serve hot h'ors d'ouvers!!! Okay maybe my spelling is off but I'm so tired I can hardly read the screen here! My very good friend, John Davis (director, writer, all around cool guy who shares many nerdy passions with me) has a blog. It's his realized love of Astrophotography and I can tell you, having seen the guy in action, he's doing it and doing it great right out of the barn. Here's the link so PLEASE go and enjoy. If you're into space, science and stuff(and who amongst us SF geeks isn't?) this blog will take you there...so take a peek and welcome John to the world of the blogisphere! Myself I have been excessively busy in recent days. So I'm putting up all kinds of info and what I can so I can keep a presence here until some more arty things can be posted!! I'm usually pretty "up" on this blog or at least in good spirits. But I had an experience this week that I want to pass along to some of you who are graduating school and going out into the "real" world. TALK IS CHEAP. Talk is the cheapest, easiest currency around. I had a offer to "license" my work to, shall we say, an "trendy apparel" company name, and I got a rather forward letter saying how they loved my stuff and wanted to use it on T shirts, belts, etc. What happened was we chatted a bit on email back and forth. They seemed large enough a company, and a "conference call" was scheduled wherein I was to be told "the deal we're offering". The appointed time came and no call. So I emailed a gentle reminder that I was in. Minutes later I got a terse "Thanks anyway, we got someone else". HUH? These are what I call SLIMEBAGS. They are these trendy, corporate ("evil") "giants" that promise all and then turn around and tell you to take off. It happens to the best of us. Often the decisions are made from "trend" marketeers who are in and out of "image" jobs like revolving doorsand want the World. Well, looks are always decieving and, The World Is Not Enough, to steal a James Bond title. The jobs themselves are as vaporous as the trends they entail. The people involved have little or no talent and, they want YOU with YOUR TALENT to MAKE THEM LOOK GOOD AND MAKE MONEY ON YOUR HARD WORK. The lesson is, never think a deal is done until you get it in writing or, the contract in your hands. Also, never trust casual inquiries, no matter how promising. Never give ideas to people you don't know. Always be on your guard for "fast talk" as it's truly the cheapest thing around. It costs them nothing, but it will cost you...everything.